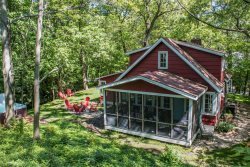 This meticulously maintained, beautifully decorated, 2BR/1BA, dog friendly cottage is tucked away on a secluded property in Lakeside, MI, just 2 blocks from Lake Michigan. It is one of two side-by-side cottages on the property. Hydrangea Hideaway offers a relaxing experience for a couple or small family. In addition, well behaved dogs are welcome. The open concept floor plan, which includes a fully equipped kitchen (sans dishwasher), a dining room with rustic oval table with seating for 4, and a living room with a comfy couch and 2 comfy chairs, creates spaciousness without loosing that cozy cottage feeling. From the living room guest can access the large screened in porch with another table with 4 chairs perfect for dining al fresco as well as a cafe table with 2 chairs perfect for enjoying a your morning cup of coffee. Two bedrooms, one furnished with a queen bed and one with a twin bunk bed, as well as 1 full bathroom complete this wonderful cottage. Amenities include an outdoor deck with fire pit, washer and dryer in a common area, DVD player, air conditioner for nights when summer breezes don't blow, a fireplace for those cool summer or snowy winter nights, and a large grassy yard with mature vegetation. With its central location, guests are just a short drive from numerous restaurants, shops, and nature trails located in the surrounding communities. Next to Hydrangea Hideaway is another 2BR 1BA dog friendly cottage called Peony Place. These cottages are gems. They are available for rent separately for couples or small families or together for a great family compound. Click here for more information on Peony Place.